Mercoledi 21 febbraio alle 23.00 Xing presenta Exaggerated Footsteps, una 'camminata sonora' pensata per la città di Bologna da Davide Tidoni nel contesto delle iniziative di La via Zamboni. L'iniziativa è gratuita ed è rivolta ad un pubblico non specialistico, basandosi su un coinvolgimento attivo che trasforma lo spettatore in performer con un sistema di istruzioni semplici. Per l'occasione saranno prodotti degli oggetti sonori da indossare: placche di metallo da fissare alle scarpe, che produrranno la colonna sonora della camminata collettiva in spazi all'aperto e al chiuso della città, nel percorso progettato. I multipli in acciaio cromato sono in vendita da Modo Infoshop. Wednesday 21 february at 11pm Xing presents Exaggerated Footsteps, a sound walk conceived for the city of Bologna by Davide Tidoni, in the context of the cultural program of La via Zamboni. Exaggeratyed Fottsteps is a participatory call that translates the 'reading' of the city of Bologna into a collective sound dèrive, a psycho-geographical night demonstration. Researcher and sound artist, Tidoni has always been interested in the human and relational dimension of listening and the ways in which sound is used and consumed in everyday life. This outdoors action, curated by Xing as a sound event dedicated to 1968, seeks to return a complex cultural interpretation of that now distant period/historical event. Intersecting the critical approach of the movements that have marked those years, Exaggeratyed Fottsteps intends to build a different attitude that moves the 'users' from an often brutal and unscrupulous consumption plan to another one, in which perceptive attention is able to guide our steps making us more aware of the their effect - in this case acoustic- on the environment, and vice versa. The initiative has free access and is aimed at a non-specialist audience, based on an active involvement that transforms the viewer into a performer with a simple system of instructions. 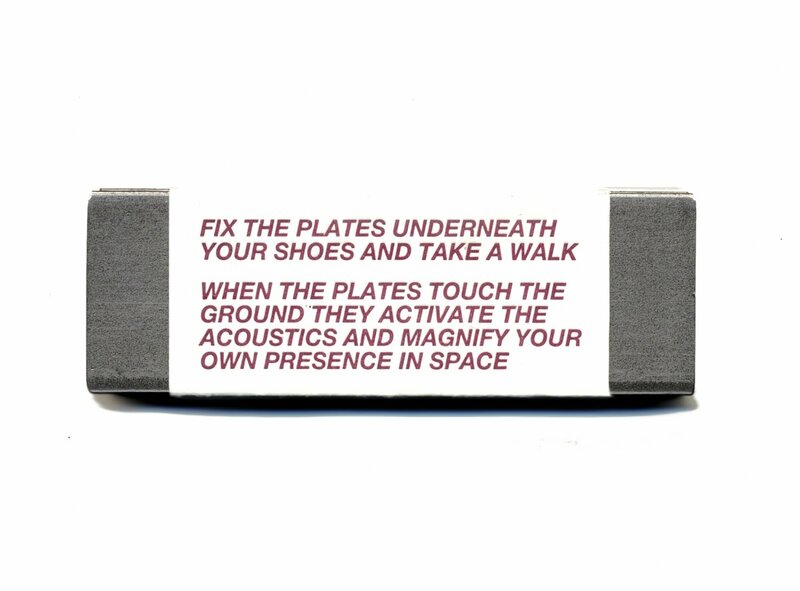 For the occasion, sound objects to wear will be produced: metal plates to be fixed to the shoes, which will produce the soundtrack of the collective walk in the outdoors and indoors of the city. The multiples in chromed steel are on sale at Modo Infoshop, Bologna.